Just as Alfredo Corchado and his girlfriend are getting ready to go out to dinner with some journalist colleagues the festive mood is disrupted when Alfredo answers a cell phone call. A longtime source tells him that there is a plan to kill an American journalist within twenty-four hours and that three names have come up, one being Alfredo’s. That was in July 2007 and the last time Corchado felt safe in Mexico. Corchado is a Mexican-American journalist who was born in Durango but moved to the U.S. when his father came to work in the fields. His professional career has led him to reporting for major U.S. newspapers from Mexico at a time when there has been a surge in violence due to the drug wars that have been plaguing the country. While his initial reaction is to continue reporting and investigating who ordered a hit on the reporters, Corachado also realizes that while he may have a lot of leeway and freedom in Mexico, times have changed. Just because he writes for an American paper doesn’t mean he is safe. His family and friends caution him and urge him to head back to the United States but I think he feels that if he were to do that, he would be giving up on Mexico just like so many other people have. What I really liked about his account is that he mixes history with current events to give the reader a picture of how the country has changed over the last 50 or so years. It was not always like this. People could walk around safely at any time of the day and enjoy being owners of small businesses. People could travel and see the beauty of Mexico. Now, not a day goes by without reading about a violent episode. While it’s not his role to offer solutions I do like that he shows the role that politics on both sides of the border have played and how the people of Mexico have suffered as a result of this. 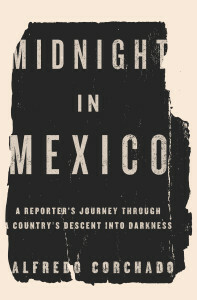 A truly fascinating look at a very dark time in Mexico’s history. This sounds very good! Real life suspense of dangerous times. This does sound good! Fascinating and scary. I find stories about journalists so interesting. Maybe because in an alternate universe I might be one myself. I will have to look for this one. Yes, this does sounds good! I’m fascinated by the work of journalists as well. I’ll have to check this out. This sounds like a good narrative nonfiction.